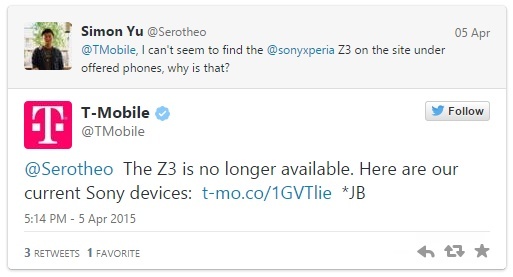 T-Mobile has recently announced that they had removed support from Sony’s high end smartphone, the Xperia Z3 just five months after release. The information was received when a guy placed a query to T-Mobile via Twitter. He asked why he cannot find Xperia Z3 from list of available phones. T-Mobile replied that the device is no longer supported by T-Mobile carrier and gave a link of the list of available phones. Many people said that they had noticed the sudden disappearance of Xperia Z3 from T-Mobile’s list of available phones off late this week. At first there was an ambiguity whether this was a mere issue with the website or T-Mobile has deliberately removed it. Later on it was confirmed that T-Mobile is no longer providing service to the above mentioned phone. Now, the telecom company is providing support to only two of Sony’s phones, the Xperia Z and Sony Xperia Z1S. Moreover the devices are offered as a part of the the company’s Certified Pre-Owned program.